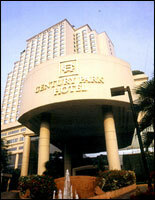 Century Park Hotel ideally located in the Pratunam - Victory Monument area, with the Victory Monument BTS station nearby. Located in Bangkok city center and close to the Expressway to the Airport. Shopping, restaurants, banks and offices are located nearby. The hotel comprises 380 attractive and well appointed guestrooms and suites, and comes with a full range of international standard amenities, including personal safe, high speed internet (256 kbps), electronic key card access, IDD telephone and Internet access point, and remote controlled TV with satellite channels including full range of pay movies. All guestrooms are spacious, and have private bathrooms with separate shower in all rooms, hair-dryer, mini-bar, coffee and tea making facilities, individually controlled air-conditioning and sprinklers and smoke detectors for guest safety. An Executive Club floor located on the top floors of the hotel. Guests on these floors will enjoy exclusive hospitality, which includes pre-registration and express check-in and check-out services by Guest Relations Officers. A private meeting room is available for rental for meeting function as well as private reception. The Club officers will be pleased to assist you on secretarial services as well as arrangements for any personal matter. The Century Park Hotel also offers an extensive range of banquet and meeting facilities on the 2nd and 3rd floors. The elegant and pillarless "Grand Ballroom" can accommodate up to 1,000 persons for cocktails and 600 persons for dinner. The Sukhothai and Ayutthaya rooms offer flexible facilities to accommodate meetings, parties and dinner which vary from 10 up to 250 pax. The latest state of the art technology is available in the ballroom and all function rooms. There is ample outdoor and underground parking available to our guests. A relaxed all day dining facility, specializing in buffet service. Featuring a mix of Western and Asian dishes for breakfast, lunch and dinner, with an impressive a la carte menu to support. A daily celebration of Italian cuisine awaits you at this spectacular restaurant. Delicious "Antipasti" Lunch Buffet, and creative a la carte menu dining for lunch and dinner. Spacious Private Rooms are available for your private dining needs. A great place to unwind and enjoy the stylish and relaxing atmosphere in the main entertainment location of the hotel. Enjoy a cool beer, light snack, or our extensive a la carte menu featuring American/Western cuisine, or just relax and listen to your favorite music or live entertainment. Special features include full audio and satellite for major sporting events (A Great place to let your Hair Down). An ideal rendezvous lobby lounge that combines comfortable Western decor with Thai touches. Enjoy light yet healthy snacks, afternoon teas and creative alcoholic and non-alcoholic cocktails, served by our gracious traditional Thai-costumed hostesses. A pastry shop featuring an assortment of freshly baked pastries, cakes and breads from the hotel's own kitchen, and a wide selection of gourmet coffees and teas. Put some splash into your day. Enjoy luscious tropical drinks and tempting snacks as you relax by the poolside. The hotel's Business Center provides office and secretarial services to facilitate all business needs. Featuring facsimile services, photo-copying, word-processing, internet service, international courier service, telex and translation. A reference library, office equipment, cellular phones for rent plus private meeting room for a small conference are also available. The hotel offers a Fitness Center with a full range of international standard cardiovascular equipments and aerobics classes. Experienced and qualified instructors are always on hand to help the guests. The outdoor landscaped swimming pool is an ideal place to sunbathe and relax in the privacy of our rooftop garden.